Who was Clyde Cessna, and where and how did this incredible designer get his start in aviation, leading to the creation of arguably the most iconic general aviation aircraft brand? Clyde Cessna’s name, at least his surname, is instantly recognized by pilots and aviation enthusiasts the world over. Over the years, the Cessna Aircraft Company has provided pilots with a variety of aircraft models that cover many different missions, from the ever popular, all-purpose Cessna 172 (the most produced GA aircraft ever) to the two-seat Cessna 152 trainer, the classic Cessna 182 Skylane, the strong and fast Cessna 206 Stationair, the iconic Cessna 180 and 185 Skywagons beloved by backcountry pilots, the reliable Cessna 210 Centurion, the popular twin-engine Cessna 340, and so many more. But who was Clyde Cessna, and where and how did this incredible designer and engineer get his start in aviation, leading to the creation of arguably the most iconic general aviation aircraft brand? Clyde Vernon Cessna was born in Iowa on December 5th, 1879. His family moved to Kansas when he was two years old, and he grew up on a farm and began helping out as soon as he was able. Clyde had a natural ability mechanical ability and loved to take equipment apart and reassemble it. Even from an early age, he used his self-taught skills and natural aptitude to both improve the efficiency of farm equipment and develop better methods of farming. (I believe I was busy playing in the field behind my childhood house at this point in my life…) Eventually, Clyde’s love for the mechanical spread to cars, and he became a successful car dealer in Enid, Oklahoma. In 1910, Clyde witnessed an aerial exhibition that would dramatically change the course of his life. He was amazed by what he saw at the exhibition and decided to learn everything he could about flying and aviation. Moving to New York, he worked at the Queen Aeroplane Company for a short time, experiencing hangar life and learning how aircraft were constructed. Though Clyde wasn’t there long, he soaked up all the information he could, and would use that knowledge to create his first monoplane. In 1911, finding inspiration from the American version of the Bleriot XI, Clyde created his first monoplane using linen and spruce. This initial creation was known as the “Silverwing,” and was powered by an Elbridge 4 cylinder motorboat motor with 40 hp. For the first test flights, Clyde headed to the Great Salt Plains in Oklahoma, located next to the Salt Plains National Wildlife Refuge. Unfortunately, his first flight attempt ended in a ground loop and a $100 repair bill. Clyde was not discouraged, however, and climbed back into that cockpit time after time, attempting to fly another thirteen times. And though each time was a failure, he managed to walk away relatively unscathed. Finally, he became airborne on the thirteenth attempt in the Silverwing, though he managed to stay airborne for only a short time before he crashed into a stand of trees while attempting to turn the aircraft. Thankfully, he didn’t carry through on this threat, and he went back to work. His meticulous planning and continual improvement of his design finally paid off. In December 1911, Clyde Cessna completed a 5 mile (8 km) flight, including a successful landing back at his point of departure. Thanks to this success, the many people who had been scoffing at his attempts to fly did an about face, celebrating his success and even calling him “The Birdman of Enid.” Riding the success of the Silverwing, Clyde decided to leave his career in the automotive industry and devote his full attention to aviation. Between 1912 and 1915, he created a number of monoplane designs, all powered by an Anzani 6-cylinder engine, providing between 40 and 60 hp. During this time, he also took to the skies flying for holiday events and county fairs, something which proved surprisingly lucrative. This also earned Clyde Cessna the distinction of being the only man to construct and fly an airplane between the rugged Rocky Mountains and the great Mississippi River. In 1916, Clyde acquired a vacant building where he planned to build aircraft for the upcoming 1917 aviation exhibition season. Seeing the demand for aviation growing, he also opened a flight school that ran out of his new factory, quickly enrolling five students. Unfortunately, after the US entered World War 1 in 1917, the exhibition flying market came to a halt, putting a damper on Clyde’s primary source of income. And so he relocated back to his family farm in Kansas and resumed a farming lifestyle. After WWI ended, there was a huge push for new aircraft and private flying, so in 1925, Clyde Cessna partnered with Lloyd Stearman and Walter Beech to create the Travel Air Manufacturing Company in Wichita, Kansas. Clyde served as the company’s president, and it soon became one of the leading US aircraft manufacturers. This was due in large part to Clyde’s advanced design ideas and the attention brought to their aircraft as the aircraft were used to set a variety of distance and speed records. Clyde remained with Travel Air Manufacturing Company for 2 years but found his own interests gravitating toward monoplane designs while his partners were more interested in biplane designs. When he proposed a monoplane design without wing struts, his Travel Air associates dismissed the idea, claiming it was folly. This prompted Clyde to resign from the company and build a fully cantilevered wing monoplane on his own. This aircraft, known as the Comet, inspired him to start a new business focused on monoplanes. 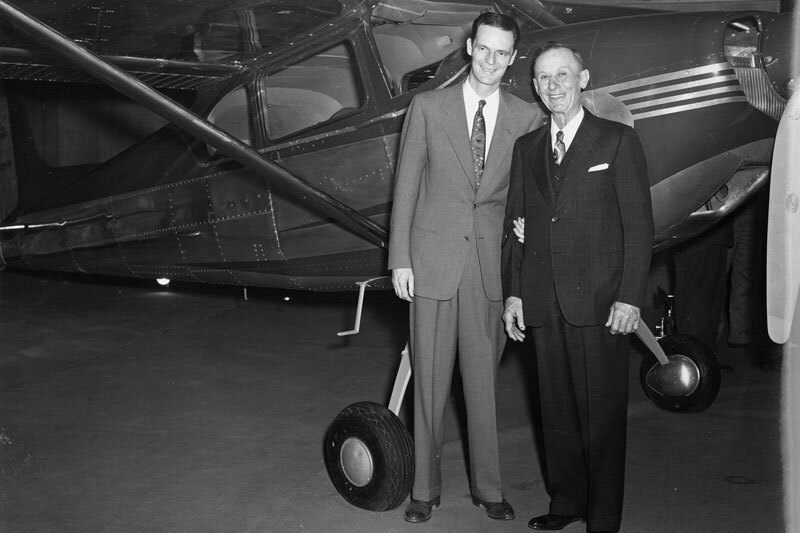 In September 1927, Clyde partnered up with aviation entrepreneur Victor Roos to create Cessna-Roos Aircraft. This partnership turned out to be very short-lived and only one month in, Roos chose to resign and sell back his interest in the company to Clyde. Finally, in December, Clyde was able to drop Roos from the name and the Cessna Aircraft Company was born. Clyde continued to perfect his monoplane design which included enclosing the cockpit. In late 1927, the company released the AW model, followed by the CW-6 which flew in 1928, and the DC-6 in 1929. In 1929, Clyde began collaborating with his son Eldon on the CR-series of racing aircraft. However, the Great Depression hit and even though the company was able to keep their doors open longer than most, the Cessna Aircraft Company eventually declared bankruptcy and closed their doors in 1931. Interestingly, though they closed the company, Clyde and Eldon started a new business building custom racing aircraft for few years. However, in 1934, Clyde’s nephew’s, Dwane and Dwight Wallace approached him with a plan and persuaded him to reopen the company and take control once more. The pair contacted all of the Cessna Aircraft Company stockholders and let them know that if they allowed Clyde to come back as president and resume construction of aircraft, then they and Clyde would all work for free until the company began to show a profit. The stockholders agreed, and Clyde returned to his role as president, with Dwane Wallace serving as the general manager at the young age of 23. It’s not known exactly why, but whether because of a family dispute, a lack of interest in working for free or some other reason, Eldon did not rejoin the company and instead moved to California where he began working as a design engineer for first the Douglas Aircraft Company, then North American Aviation, and finally Rockwell International. During this period, he helped with the designs for both the P-51 Mustang and the F-86 Fighter Jet. As the company began to recover, they introduced the C-34 (for the year 1934), the first of Cessna’s iconic Airmaster family. 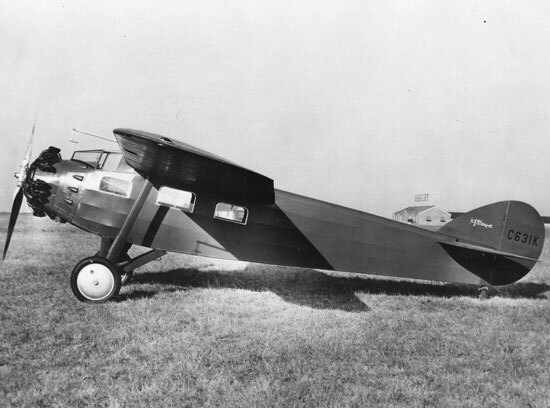 The four-seat C-34, a high-winged aircraft with a strutless cantilever wing design, featured Cessna’s first flaps and was considered incredibly efficient for the time. Wallace flew the C-34 for more than 4,000 hours in its first five years, including a trip to Mexico where it reportedly averaged 17 miles per gallon. The plane was also a racing favorite and was considered nearly impossible to beat. Among its racing wins was the Detroit News Trophy for “The World’s Most Efficient Airplane.” Eldon Cessna first won the race in 1931 in a Cessna model AW, after which is was shut down due to the depression. However, four years later, it was restarted in 1935, and Cessna test pilot George Harte won the race, followed by another Cessna win in 1936. 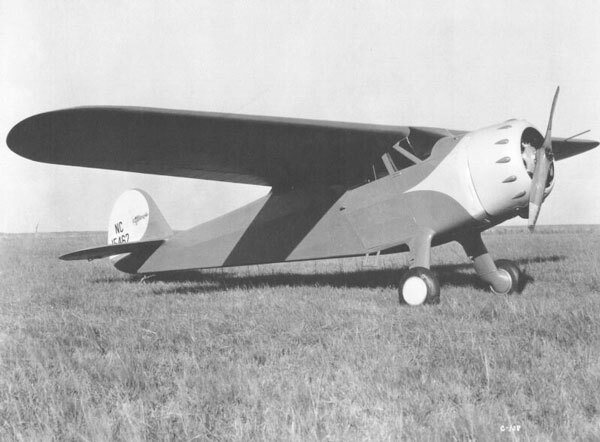 This triple-win meant that Cessna was allowed to keep the trophy permanently, and the C-34 was designated the world’s most efficient airplane. Finally, in 1936, Clyde Cessna retired from the aviation business, selling his interests to his nephews and returning to a life of farming. During his two-year return from 1934-36, it is said that Clyde had served more in a ceremonial capacity and stayed out of the day to day functioning of the company. Regardless, after more than twenty-five years in aviation, Clyde Cessna’s contributions and impact were far reaching. Clyde Cessna and Dwane Wallace, photo courtesy of Cessna/Textron. 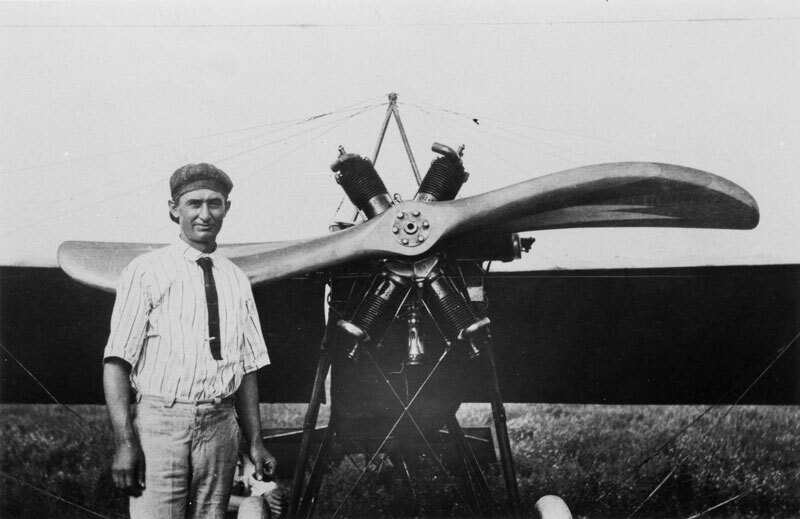 Clyde Cessna is remembered for incredible contributions to aviation in three areas. He was a champion of early monoplane design, he founded one of the most iconic and enduring aircraft manufacturing companies in the world, and he pushed the design of high-efficiency general aviation aircraft. On a personal note, Clyde Cessna’s story is all the more impressive to me for a few additional reasons. Clyde achieved success with only a rudimentary education, and mostly self-taught skills. He was also dedicated, resourceful, and smart, and refused to take no for an answer, continuing to push forward, even in the face of repeated failure. And finally, he did all this without ever holding a pilot’s license. Clyde Cessna definitely deserves a spot alongside other aviation pioneers like the Wright Brothers, William Boeing, Louis Bleriot, Igor Sikorsky, Otto Lilienthal and countless others.